This is a sponsored post written by me on behalf of Crisco®. The opinions and text are mine. I love the holiday season! From the smell of the Christmas tree to wrapping presents while singing Christmas carols and spending time with family-it is such a joyous time of year! But for my family, it’s also the busiest time. We love having people over and hosting parties. From being a new mom and keeping up with work, I’m always looking for ways to save time, especially when it comes to entertaining. One of my time saving tips is to always keep Crisco® All-Vegetable Shortening on hand. You don’t have to let the shortening get to room temperature before using it and since it has a higher melting point than butter, you don’t have to “chill” the dough before baking! I love to make a large batch of sugar cookie dough the morning before I plan to have people over. Shortly before they arrive I start to bake batches of cookies one at a time. There’s nothing better than the smell of cookies baking in the oven. It takes very little effort and instantly makes folks feel welcome. Here are some baking tips for making the dough your own. Plus, scroll down for my Sugar Cookie Birthday Cake Sandwich Cookie recipe. TIP #1 Get thicker, airy and light-texture sugar cookies by replacing butter with Crisco® All-Vegetable shortening. 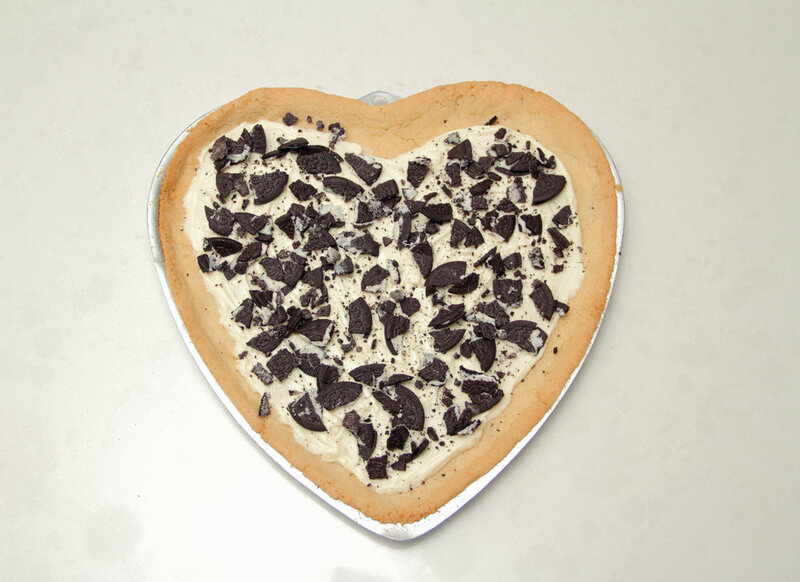 TIP #2 Make a sugar cookie cake/pizza by pressing sugar cookie dough into a cake or pizza pan and baking. 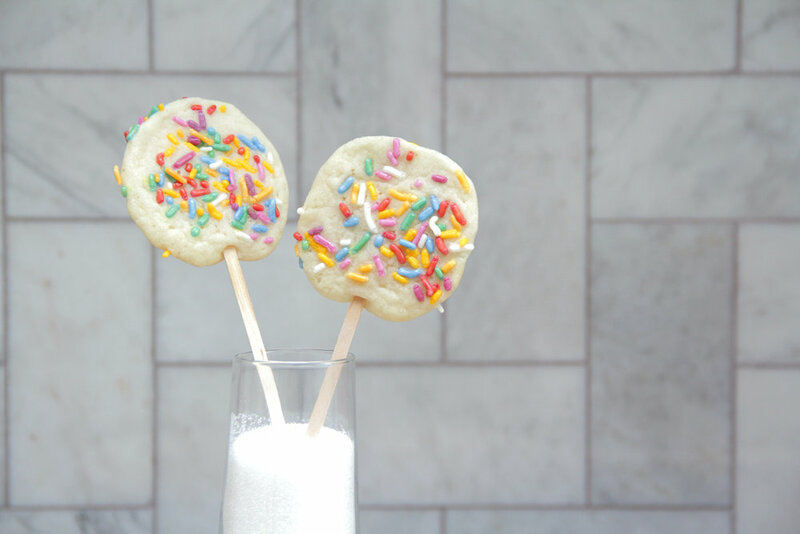 TIP #3 Before baking, press wooden sticks into center of sugar cookie dough to make cookie pops. Great for holiday party favors or even for milk dunking! TIP #4 For quick and easy decorating, add Crisco® All-Vegetable Shortening when melting chocolate. This creates a smoother consistency perfect for dipping sugar cookies, fruit and pretzels (add ½ teaspoon Crisco® All-Vegetable Shortening per 1oz of chocolate). TIP #5 Create your own flavor combinations by adding dried fruits, nuts and/or candies to your favorite sugar cookie dough recipe. BLEND in egg, milk and vanilla. Gradually blend in flour mixture. Fold in ½ cup sprinkles. DIVIDE dough in half. Roll out each half on lightly floured surface to 1/4-inch thickness. Cut with 2 ½ inch round fluted edge cookie cutter. Place 2 inches apart on baking sheet. To assemble sandwich cookie: Frost the bottom of one cookie and press another cookie on top. Garnish edge of cookies with sprinkles.